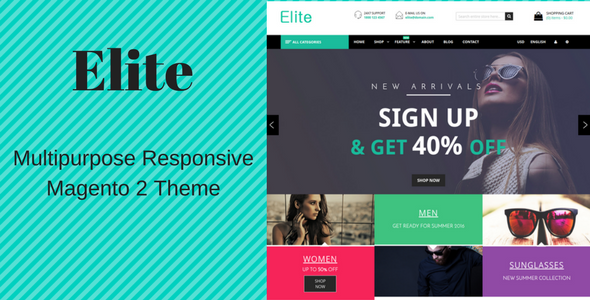 Elite is a multipurpose Responsive Magento Theme suitable for every kind of online store. Theme is built using Bootstrap 3 making it fully responsive. Some features of theme includes Ajax Add to Cart, Product Quickview. Admin manageable Main slider and product carousels etc. Elite Magento2 template is suitable for selling all things such as : furniture products, fruits, vegetables, supermarket, grocery, fashion, flowers, gifts, toys, mobiles and tablets, cosmetic, drug, products for healthy, accessories etc.